As you may have noticed I absolutely love using facial scrubs, though I haven't really explored using body scrubs. Recently, I was given the opportunity to trial Kiehls Gently Exfoliating Body Scrub and I'm glad I came across this scrub as I haven't given much attention to my skin in the past! Kiehls Gently Exfoliating Body Scrub is packaged in a very convenient plastic tube with a flip-top lid. Kiehls Gently Exfoliating Body scrub is definitely one of those body products which is formulated with an unusual scent/fragrance. There are four scents in this Gently Exfoliating Body Scrub line and they are grapefruit, pear, coriander and lavender. I decided to trial the coriander scented body scrub as I was curious to know what the product would be like. I would have never really picked the scent coriander over lavender, as I absolutely adore the scent of lavender in general. 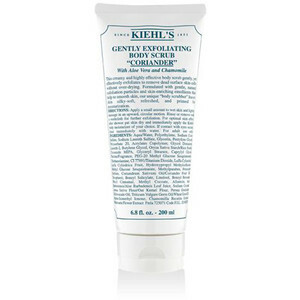 The scent of coriander from Kiehls Gently Exfoliating Body Scrub was very strange at first as the scent was very different! There was a subtle hint of fresh coriander and when I say fresh I mean that the scent was very refreshing! When squeezed out of the tube, the scrub appeared to be very foamy and creamy at the same time with a decent amount of exfoliating particles. The exfoliating particles looked more gentle than it appears. The scrub was very nice and worked very well to buff dry areas of my body such as the elbows and knees. One of the key qualities of this scrub I loved is the beautiful and soothing milky consistency the scrub forms after massaging the product onto the skin. My skin feels very smooth and moisturised after using this scrub and this is probably because the scrub contained aloe vera. Kiehls Gentle Exfoliating Body Scrub is available in a 200ml tube and retails for A$30 at Kiehls counters and online. Have you adopted Kiehls Gentle Exfoliating Body Scrub for your shower? Which scents from the range would you prefer? Product was provided for consideration only. This review is 100% based on my own thoughts and opinions. I am not affiliated with Kiehls and did not receive remuneration to post these product reviews.